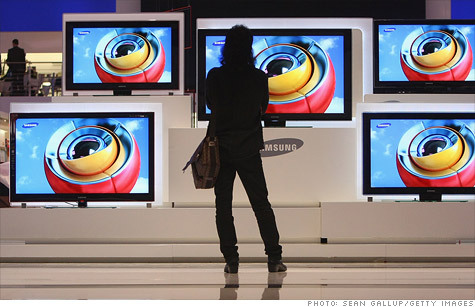 Samsung is among the firms that have agreed to a $538 million price-fixing settlement. NEW YORK (CNNMoney) -- Eight state attorneys general announced a $538 million settlement with electronics makers Tuesday over allegations of price-fixing in LCD panels. Florida attorney general Pam Bondi said in a statement that electronics manufacturers including Hitachi (HIT), Sharp (SHCAY) and Samsung had "organized the conspiracy at the highest levels of their organizations in various secret meetings and telephone conversations." The companies are accused of colluding to fix prices for thin film transistor LCD panels, which are used in a variety of consumer products including computer screens and flat-panel televisions. The New York attorney general's office said that up to $501 million of the settlement announced Tuesday "will be available for partial refunds" for consumers in 24 states and Washington, D.C., who purchased qualifying products between 1999 and 2006. "Notice of how to file for partial refunds will be provided to the public at a later date," the AG's office said. Litigation is still pending against manufacturers, including LG Display (LPL) and Toshiba, who declined to settle, Bondi said. Besides Florida and New York, the other attorneys general involved in the suit hail from Michigan, Missouri, Arkansas, West Virginia, California, and Wisconsin. Representatives for firms named in the case, including Samsung, LG and Sharp, did not immediately respond to requests for comment. Toshiba declined to comment. In 2008, the Justice Department announced a $585 million settlement for the same price-fixing conduct in LCD panel sales with Sharp, LG Display and Taiwan's Chungwa Picture Tubes. Apple is still reasonably priced, but it's no longer dirt cheap. Who needs to own a boring U.S. Treasury bond when you can buy an exciting tech stock and get a similar -- or in many cases, higher -- yield in the process? Opinion: BlackBerry takeover? Want a bridge?